North Smithfield Town Hall is located at 1 Main Street, Slatersville, RI 02876; phone: 401-767-2200. Photo: Tyler Mowry House, ca. 1825, 112 Sayles Hill Road, North Smithfield, RI. Listed on the National Register of Historic Places in 1996. Photographed by User:Swampyank (own work), 2012, [cc-by-3.0 (creativecommons.org/licenses/by/3.0)], via Wikimedia Commons, accessed June, 2014. North Smithfield lies along the state's northern border with Massachusetts. The rough forested and hilly landscape is marked by the presence of two major water-power sources, the Blackstone and Branch Rivers, in the north part of town. A variety of historic man-made resources, including an assortment of single-family houses, help document the ways in which North Smithfield residents have used and enhanced the town's topographical features and natural resources over time. The earliest settlement in North Smithfield occurred in 1666 when the town was part of Providence. In the seventeenth and eighteenth centuries, North Smithfield experienced intense agricultural development, and in 1731 was set off as a separate town. Small-scale saw mills, grist mills and the like served the farming communities. A number of excellent early houses exist, often with a series of additions and expansions to the initial house form. In the nineteenth century, considerable industrial development occurred along the Branch and Blackstone Rivers in the north part of town, and several thriving mill villages were created from tranquil crossroads hamlets: Walter Allen, a master builder, erected several substantial houses with exceptionally fine porticos and other details in Union Village just after 1800. Other villages grew around the textile mills at Slatersville, Branch Village, Waterford, and Forestdale, as industry outstripped agriculture in the middle of the nineteenth century. In Slatersville, and elsewhere, fine single-family houses built in popular styles for mill managers, professionals and businessmen complemented the more functional stock of mill workers' houses. Nineteenth-century transportation improvements helped the burgeoning small industries. The Blackstone Canal, in operation from 1828-1848, and the Providence & Worcester Railroad, opened in 1847, followed the Blackstone River valley corridor and greatly improved transportation linkages to the north and south. As agriculture had declined in the nineteenth century, so industry also declined in the twentieth century. An important reversal was the construction of a new mill in North Smithfield by the Blackstone Manufacturing Co. in 1904. 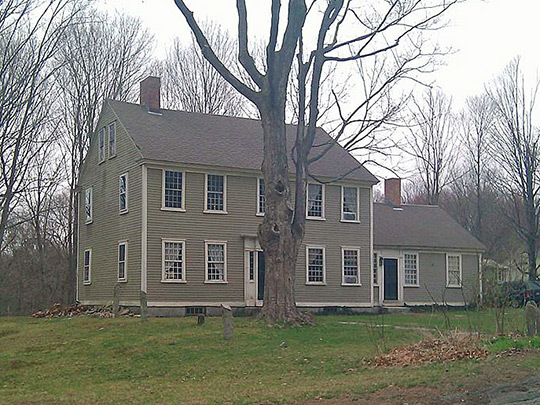 Suburban residential development characterized house construction in the twentieth century, as people moved to rural parts of North Smithfield from urbanized Woonsocket and elsewhere. Several neighborhoods of small simple summer houses were also constructed. Today, North Smithfield is a mixed community of residential, manufacturing, and commercial uses. Agriculture, once a mainstay, is a minor activity, and only a few areas of farming landscape are still worked, although other farmland is preserved as woodland.